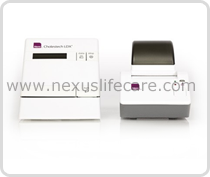 Alere Cholestech Ldx System distributors, dealers & suppliers in Mumbai, India. Product Description:- Efficient and economical point of care testing for cholesterol and related lipids, and blood glucose serve as diagnostic tools that provide information for immediate risk assessment and therapeutic monitoring of heart disease, inflammatory disorders and diabetes. Small, lightweight design for versatility and portability (21cm x 12cm or 8¼" x 4¾").